The Century Dictionary and Cyclopedia was one of the largest encyclopedic dictionaries of the English language. The first edition was published from 1889 to 1891 by The Century Company of New York, in six, eight, or ten volume versions (originally issued in 24 fascicles) in 7,046 pages with some 10,000 wood-engraved illustrations. It was edited by Sanskrit scholar and linguist William Dwight Whitney, with Benjamin Eli Smith's assistance. It was a great expansion of the smaller Imperial Dictionary of the English Language, which in turn had been based on the 1841 edition of Noah Webster's American Dictionary. After Whitney's death in 1894, supplementary volumes were published under Smith's supervision, including The Century Cyclopedia of Names (1894) and The Century Atlas (1897). A two-volume Supplement of new vocabulary, published in 1909, completed the dictionary. A reformatted edition, The Century Dictionary and Cyclopedia, was published in 1911 in twelve quarto volumes: ten of vocabulary, plus the volume of names and the atlas. This set went through several printings, the last in 1914. The same year, the ten vocabulary volumes were published as one giant volume, about 8500 pages in a very thin paper. The now much coveted India paper edition also appeared around this time, usually in 5 double volumes (rarely, in 10 single volumes) plus one additional for the Cyclopedia. The completed dictionary contained over 500,000 entries, more than Webster's New International or Funk and Wagnalls New Standard, the largest other dictionaries of the period. Each form of a word was treated separately, and liberal numbers of quotations and additional information were included to support the definitions. In its etymologies, Greek words were not transliterated. 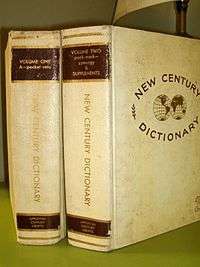 Although no revised edition of the dictionary was ever again published, an abridged edition with new words and other features, The New Century Dictionary (edited by H.G. Emery and K.G. Brewster; revision editor, Catherine B. Avery,) was published by Appleton-Century-Crofts of New York in 1927, and reprinted in various forms for over thirty-five years. The New Century became the basis for the American College Dictionary, the first Random House Dictionary, in 1947. The three volume New Century Cyclopedia of Names, an expansion of the 1894 volume, was published in 1954, edited by Clarence Barnhart. The Century Dictionary was admired for the quality of its entries, the craftsmanship in its design, typography, and binding, and its excellent illustrations. It has been used as an information source for the makers of many later dictionaries, including editors of the Oxford English Dictionary, who cited it over 2,000 times in the first edition. In 1913, Stewart Archer Steger from the University of Virginia published his Ph.D. dissertation "American Dictionaries" and devoted a 14-page Chapter VI to Century Dictionary. He concluded the chapter with these words: "Altogether, The Century Dictionary far surpasses anything in American lexicography". The works are out of copyright, and efforts have been made to digitize the volumes. Adams, James Truslow. Dictionary of American History. New York: Scribner, 1940. Bailey, Richard, et al. "Forum: Centennial Celebration of The Century Dictionary". Dictionaries: Journal of the Dictionary Society of North America 17 (1996): 1–125. 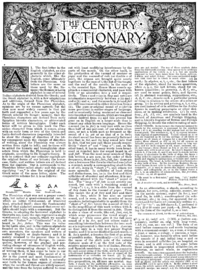 The complete Century Dictionary is in image form, where it can be searched by the word or viewed by the page in its original form, with zoom-in option.